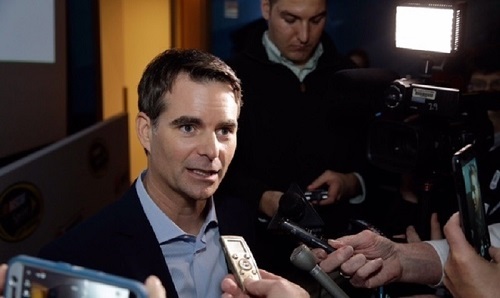 Four-time NASCAR Sprint Cup Series champion Jeff Gordon has transitioned into a TV career since his retirement from driving at the end of the 2015 season, walking into the NASCAR on FOX broadcast booth. He may not stop there, though, as reports, including one from TVline.com, list Gordon as an individual at the top of a short list to become the full-time co-host of Kelly Ripa on the daytime talk show, Live with Kelly. Gordon already has experience co-hosting with Ripa on Live. He’s filled-in as a co-host on the show 10 times, nine times working with Ripa and another time with one of the show’s former co-hosts, Regis Philbin. If Gordon were offered the position and accepted it, he would be the permanent replacement for former National Football Leaguer and Pro Football Hall of Fame member Michael Strahan, who left the show for a full-time gig on Good Morning America.